Sciatica is a condition whereby the sciatic nerve becomes irritated and causes pain, often from the lower back all the way down to the toes. Sciatica is caused by irritation to the sciatic nerve. The sciatic nerve originates in the lower back and runs down to the feet. Sciatica can be caused by irritation to the sciatic nerve anywhere along its pathway. However, the most common cause of sciatica in the office worker is irritation to the sciatic nerve either in the lower back or in the gluteal region. Sciatica usually presents as a very specific band of pain. "Specific" is the key word. If you can't pin-point exactly where your pain is (i.e. if the whole leg just aches or if your symptoms are quite vague), it is unlikely that you have sciatica. Sciatica typically runs as a band of pain through the gluteal, and down the hamstring, as well as sometimes travelling as low as the calf muscle. If your symptoms also include pins and needles and/or numbness, the severity of your sciatica is worse than if you just have pain. Poor office ergonomics can be a significant contributing factor to the development of sciatica. Further, if you already have sciatica, poor workstation ergonomics is likely to make it worse. A leading ergonomic issue in relation to sciatica is lower back pain that is caused by poor sitting posture. It you adopt a slouched or slumped posture, or you lean forward at your desk, you place an increased strain on your lower back. For more information about this, see the ergonomic back pain page by clicking here. This can result in your lower back muscles going into spasm. The sciatic nerve has to run through these muscles. If they are spasmodic, there is an increased chance the sciatic nerve will become irritated. Firstly, in sitting, your bodyweight is transferred from your upper body to your pelvis, through the lumbar spine. This means there is a constant, and monotonous, compressive force going through the lower back. Over time, this can cause irritation to the nerves as they leave the spinal canal. This is more of a problem for those who already have sciatica. 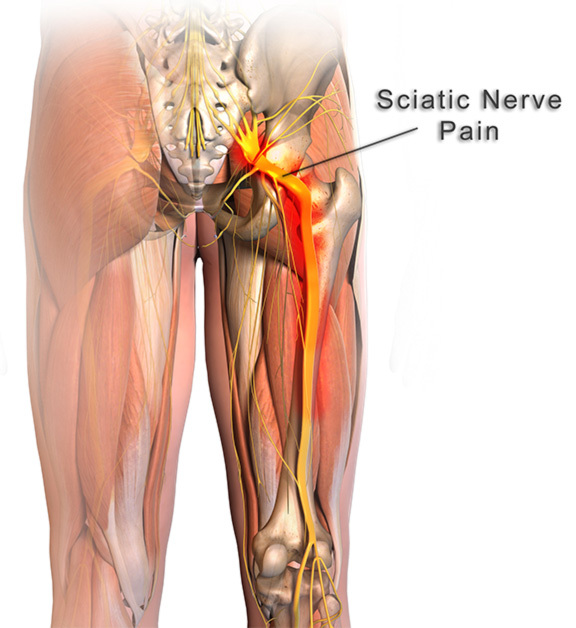 Sciatica will often cause inflammation around the nerve root where it exits the spinal canal. This means there is less "wiggle" room for the nerve to move and constant compression may impinge this nerve. Secondly, the sciatic nerve runs through the gluteal region. Specifically, it runs through a muscle called the piriformis muscle, which happens to be in approximately the area of your sitting bone. When you sit, you quite literally sit on the piriformis muscles and the sciatic nerve. Therefore, when you sit, you are compressing the sciatic nerve. Constant compression can result in the piriformis muscle going into spasm. Similarly to above, if the piriformis muscle goes into spasm, the sciatic nerve is likely to be compressed and irritated, leading to some form of sciatic symptoms. What to do about Sciatica in the Office Worker? The first thing that should be done is to get an assessment by a physiotherapist. They will be able to help you with a rehabilitation plan and with hands-on treatment to alleviate your symptoms. Second, an ergonomic assessment is a good idea. It's best practice to allow a professional to perform an ergonomic assessment for you when you're injured, as opposed to trying to do it yourself. This is because of the risk of making things worse if it isn't done properly. Try to incorporate some standing into your daily work day, to reduce the constant pressure on the sciatic nerve. Take regular walks throughout your working day and consider a stretch for your gluteal region. Ensure your office chair is not too low, as this encourages slouching. One last note - sciatica can be a tough one to treat. So where possible, involving a professional is in your best interests, whether that be a physiotherapist for hands-on treatment, or getting an ergonomic assessment.